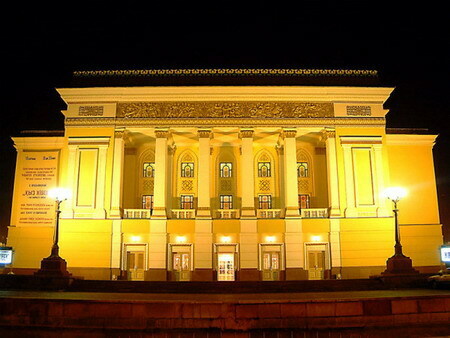 On January 13 the Opera and Ballet Theatre named after Abay celebrates its birthday, because in far 1934, it was the day when it was founded on the base of musical drama school. The first musical comedy “Ayman and Sholpan” was performed in the same year. The year later the theatre created own opera troupe, which produced “Carmen” of George Bizet. And already in 1936, after performance of opera troupe, led by Kulyash Bayseitova, in Moscow, the theatre obtained the recognition all over the Soviet Union. In 1938 the ballet troupe was created, which produced the “Swan Lake” of Tchaikovsky in the same year. Before the beginning of the war, before only 7 years, the repertoire of the theatre numbered more than 30 operas and 6 ballet plays. And in the eve of war the theatre was given the status of academic theatre. And during the war notwithstanding all difficulties, the new building of Opera and Ballet theatre was built. So far as the great number of residents of western part of Soviet Union was evacuated to Almaty, the cultural figures from Moscow and St. Petersburg began to work in this theatre, rising the level of skill of theatrical troupe. In the end of war, in 1945 the theatre was named after the great Kazakh philosopher, poet and enlightener Abay. The theatre was growing, its limits were expanding, European, Russian and Kazakh plays were produced on the stage of the theatre. Some quickly lost the public interest, others constantly were met with great applauses. The adaptation of world classic took place, operas were translated into Kazakh language, and performances acquired the Kazakh national style. The theatre, war-hardened, went on its development, the new generation of professional musicians, opera singers and dancers began the job within the walls of the theatre. New operas and ballets were produced. Bu together with collapse of USSR the theatre declined too. In connection with difficult economic situation many workers of theatre had to look for another kind of earning. But the period of stagnation lasted about 10 years, and in 2000 the full reconstruction of theatre building was finished, and favorable conditions were created for the collective. Today the collective of theatre again is increased by new soloists and dancers, who honor the memory of the theatre and work, keeping the traditions of past generations. The theatre performs on the stages of Europe, America and Asia, and also receives the troupes from the theatres of various countries. Today the opera and ballet theatre named after Abay is the largest theatre of Central Asia and undoubtedly the flagman of musical art of Kazakhstan.